HES Botlek Tank Terminal B.V. and SJR Group are pleased to announce that the last storage tank which is built offsite will be transported to HES Botlek Tank Terminal, a full subsidiary of HES International B.V., on Friday 21 July. This special transport concludes a project in which a total of seven ready-to-install tanks with a volume of 10,000 cubic metres each are transported from the SJR Group construction site on the Heijplaat to HES Botlek Tank Terminal (HBTT) over water. 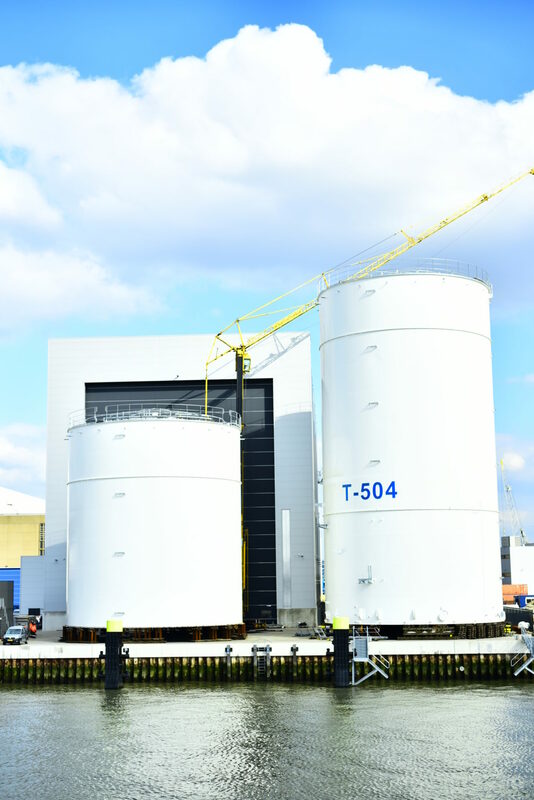 The construction and delivery of these tanks is part of a bigger project, which is set to more than double HBTT’s tank storage capacity from 200,000 to 477,000 cubic metres. The expansion has been given a huge boost with the delivery of a total of seven ready-made storage tanks. Seven of the 15 new tanks will be built by SJR Group on the Heijplaat and then transported one by one to HBTT by the floating sheerleg Matador 3. The tanks will then be installed on the first foundation and taken to their final location by special trailers (SPMTs). 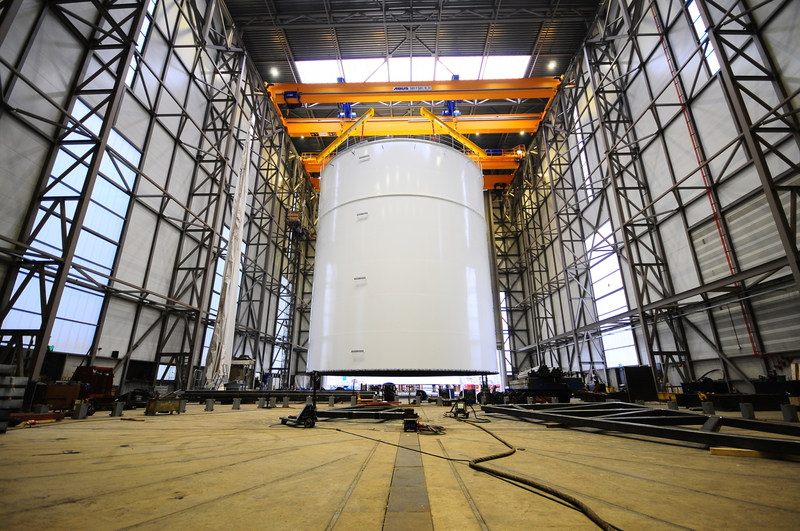 The seven 10,000 cubic metre tanks are 36 metres high, have a diameter of 19 metres and weigh some 250 tonnes apiece. A huge part of this expansion is covered by a multi-year contract. Cooperation with SJR Group went smoothly and fully within the agreed deadline and timeline. This cooperation contributed to HBTT’s philosophy of providing extremely efficient infrastructure to our customers,” says Charles Smissaert, Managing Director of HBTT. “The decisive factor for BTT to award us this contract was our ability to achieve it completely off-site. We work in a controlled environment in the centre of the Port of Rotterdam, which means that weather conditions do not affect delivery times. Moreover, inconvenience at the terminal will be kept to a minimum since we can complete all our preparatory work outside the client’s premises. Ultimately this leads to significant cost savings and installed tanks of the highest quality,” says Robert Sloot, owner of SJR Group. The last of these seven storage tanks will be transported on Friday 21 July. A spectacular sight. Those who are interested can watch this extraordinary transport from the waterside. According to plans, Bonn & Mees’ Matador 3 will depart from SJR’s dock at Gieterijweg 31 at 08:00 a.m. sailing to HBTT in the Botlek. About SJR: SJR is a dynamic company with over 50 years of history – we are constantly innovating and developing. Over the last few years, we have grown into an all-round tank producer, whose core business is the production, insulation, repair, maintenance, and modification of storage and process tanks. We do this both on-site at our clients’ premises as well as at our current production location at the RDM site in Rotterdam. We have built a state-of-the-art production facility, complete with offices, in the port of Rotterdam. This is where we can produce tanks measuring up to 24 metres in diameter and up to 32 metres in height. SJR will be significantly improving its tank construction process through the use of advanced equipment and robots. By making clever use of innovations, the quality and durability of tanks increases and, due to the favourable location of our production facility near the water, we can easily ship the tanks all over the world. We work closely with reliable partners, who are capable of dealing with exceptional cargo. In recent years, we have organised special tank transportation for customers based in the Netherlands and abroad on a regular basis.